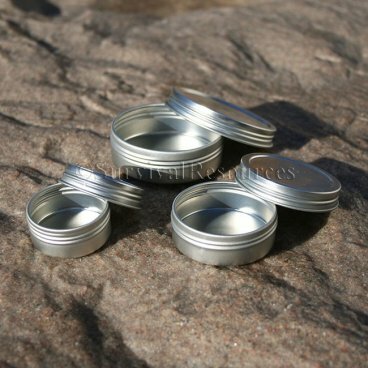 Our Slim Line Screw-Top Tins are extremely sturdy, and all edges are rolled. The screw tops allow you to secure items inside without fear of the covers falling off, which is the problem with many of the "press-fit" covers. The slim design makes them easier to pack, or even carry in a pocket. They make great tinder containers, and come in 3 sizes. Their uses are only limited by your imagination. Being they are food grade, we have used them to carry spices, coffee and tea bags, salt & pepper, etc. The smallest holds 0.5 oz. and measures 1.5" in diameter x 11/16" high. The medium holds 1 oz. and measures 1-15/16" in diameter x 5/8" high. The large is 2-3/8" in diameter x 13/16" high. These measurements are of the bottom of the tins. The lids are slightly larger around. You can buy them individually, or try our 3 pack with one of each size.